• The Phoenix Fortress SS1180 series is a range of high security safes designed and tested to the latest European test standards. • Tested to the prestigious European S2 Security standard EN14450 giving cash cover of £4,000 or Valuables cover of £40,000. • Supplied with 2 keys. • Double wall construction with anti drill plates and re-locker protection for the door provide a safe of great strength. • Ready prepared for floor fixing, with fixing bolts for concrete supplied. • Finished in a high quality scratch resistant paint Ral9003 White. This high security safe insures contents including up to £4,000 in cash or £40,000 of valuables (or Euro equivalent), as well as controlled drugs whose active ingredients don't exceed 500 grams. The large capacity provides space for important files, contracts, deeds, documents and valuables. The safe comes ready prepared to be fixed to the floor for added security, with fixing bolts for concrete supplied. The double wall construction and high security double bitted keylock keeps contents secure and protects against attacks. 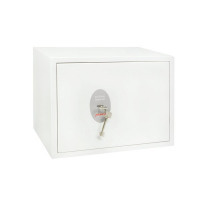 This safe is finished in a high quality, scratch-resistant paint and conforms to European EN14450 S2 standards.